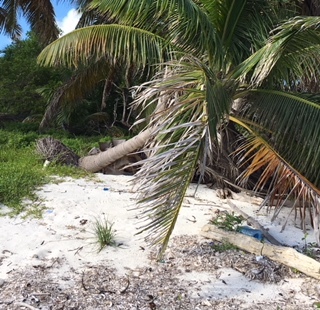 Last year's hurricanes dumped plastic trash on the beaches of Turneffe Atoll. At one of its islands, pictured above, I saw a plastic baby doll and a pair of goose barnacle covered flip flops amazingly within a foot of each other. Last year's hurricanes were the strongest recorded sucking away the sand in the atoll's beaches. The roots of palms were exposed. Some trees fell or will fall in the next hurricane. Some red mangrove trees also were lost reducing the distance between the shore and interior brackish water ponds where crocodiles mate and live. all along the narrow strip of sand new mangrove shoots poked above the sand. They grow remarkably fast to become the lung of the reef and the most protective plant of the fragile reef. But as remarkable as they are, will they stand a chance if these storms and higher tides are more frequent and pull more sand away from the shore? I am looking with binoculars across the pond at crocodiles. My granddaughter is in foreground. Behind me are the black mangroves with roots in the brackish water beginning to be stressed. Also the distance between the pond and the reef shore is half what it was in 2016. Without dry roots the black mangrove trees started dieing. Not only that the sea level has risen in recent years according to Turneffe Flats Lodge. The atoll is 30 miles long and 18 miles wide at the widest point. The whole system is threatened including Turneffe Flats Fishing Lodge and Ecotourist Resort. When we were there for one week the place looked in fine shape. They said within a few weeks after the storms the owners built a new dock, fixed the wood buildings, replaced some of the sand and planted red mangrove trees. The owners were still in the process of building a much stronger two story cement structure partly to increase the number of client rental rooms and partly for their new home. Me in my 180 degree snorkeling mask. but near the end of snorkeling I attempted to dive down. The mask started to fill with water. To make the water flow out I simply looked down and lost track of the group resulting in an interesting but unpleasant experience. I became a little separated from the group. My sympathy for all critters of the reef was made greater after this unpleasant experience. The currents around the atoll created a trash line about a hundred yards from open ocean with higher waves. I swam through the trash accidentally when I was left behind and didn't look up enough to see where I was going. I was fascinated by a big jelly fish. I was pulled a little off course by an increasingly stronger current on my way to the boat pulling me closer and closer to the colder ocean. Then I got to experience first hand how fish and critters could be trapped surrounded by plastic bags, broken floating sea weed and the little box jelly fish I feared. I told myself not to panic, but just go with the flow gradually shifting directions towards the boat. When I was parallel to the starboard of the boat, I made a right turn and started swimming hard towards the boat. My plan was to pass the boat and go around the anchor rope and head back for the ladder near the aft on the port side of the boat. Making headway was difficult. My daughter saw me and thought I was lost and came around to me and tugged at my hand to get me to turn towards the stern instead. I welcomed our role reversal and am so grateful my daughter is so wonderfully caring. What is being done and can be done? A big part of being able to experience being on a remote atoll is consumption of energy like petroleum. To reduce the amount needed, some have tried wind and solar power. But unfortunately there isn't a good way to protect the delicate machinery from high tides and winds of hurricanes. At least a method hasn't been invented yet. There is a little house on the tip of one of the mangrove islands where adventurous people come to stay without electricity, or a supply of water or any food other than what they can collect, catch or gather - survival tourism anyone? Turneffe Flats had their own green house where they grew herbs, onions and peppers. Many of their foods were purchased from organic Mennonite farmers from the mainland of Belize. Our adventure guide, Abel Coe, wants to educate Belize school children to value their natural resources by taking them out in the morning to help pick up the trash and then take them snorkeling in the afternoon. I hope he is supported in his mission. The owners of Turneffe Flats are trying to make Turneffe Atoll a Belize National Monument and Nature Preserve. A portion of the money we paid for staying at the fishing resort went to ecology efforts. They do not use micro-wave and other high powered appliances. use solar pannels to heat shower water. Limit hours of air conditioning. They also recycle black water, and collect rain water, use salt water in their infinity pool among other eco friendly practices..
Surge, a marine biologist, and the dive guide is promoting ecology world foundations. Call to scientific inventors: design equipment for atoll dwellers to convert plastic to fuel. Anyone, can you make a small island friendly machine to convert algae to biofuel? Brainstorming anyone for more ideas! Interesting and scary experience. I think it's hard to get around how wasteful we humans are. Even the carbon used in flying to such places or taking a cruise is part of the trade-off for humans eager for experiences and wanting to be eco-friendly but really not. It's our human nature maybe. Not good for earth or maybe our longevity here! We did consume oil to fly and motor boat to a remote still almost pristine tropical paradise. I regret that. Our vacationing, however, at the resort in Belize did employ three or more people for every guest. The only difference in their housing on the island and ours is that their accomidations were newer and built higher off the ground than ours. They had more living quarters per building than our duplex buildings. But the help lived well and worked a week on the island and then went home to their families for a week. Two guides,two managers and sometimes the owners joined us for dinner. The other help ate in the kitchen area. Agriculture is the #1 indusry in Belize. The fruit and vegetabel stands were bountiful. The second largest industry is tourism. Algae to fuel and food is a big issue in the scientific community. I have a good friend in Connecticut who just got a 5 Million grant to research algae in this area. He has researched algae for decades. Tabor, Good to hear money is going into studying algae.